Akoya pearls are known for their small size, perfectly round shape, and high levels of luster. They are nucleated off the coast of Japan and China in Akoya oysters, hence the name Akoya. Akoya pearls are typically white or creamy in color with overtones of pink, silver, and ivory. Their size ranges from 4mm to 9mm; anything beyond that is a rare find. Highly lustrous, these pearls are a craftsman’s darling, allowing them to create mesmerizing designs due to their small size and satiny sheen. These veritable jewels of the sea are affordable and a joy to own. Akoya pearl necklace is cherished by every woman. Their luster and sheen make the wearer’s skin glow, raising their beauty quotient a notch higher. They are used to create several jewelry adornments but they are often used to design necklaces because they considered to be specially suited for it. Uniformity in size & color, high luster and several shimmering overtones such as silver and pink make it a perfect candidate for creating top class necklaces. Choker, Princess and Matinee are some of the popular pearl necklaces that are crafted from these sea gems. 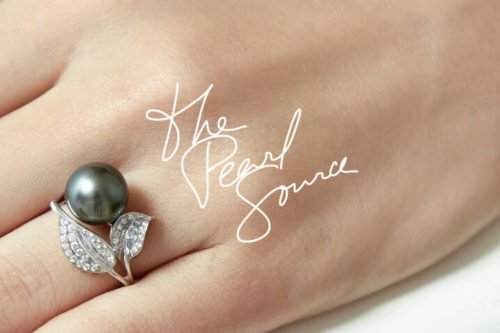 Tahitian pearls, also known as black pearls have recently become the most sought after south sea gems. First, cultured in the French Polynesia during the early 1960’s, these natural gemstones left every woman gasping with their sensuous green and silver overtones and other dark mystic colors. Although its body color is dark, it reflects colors which are difficult to name or relate to, adding to its mystique. They are considered rare and their size makes them a perfect nominee for pendants, stud type earrings and rings. READ MORE: What Is The Best Accessory When Wearing Large Pearls? Whether it is a strand or a single drop pendant, a Tahitian pearl necklace is sure to blow your beloved off her feet. This necklace looks best when worn with an evening gown. It gives the wearer a hypnotic quality, pulling gazers towards them. Necklaces created from Tahitian pearls can make any woman happy because they symbolize purity and perfection. If you are looking for an ideal gift for many occasions, it is a sure bet to go with a pearl necklace to win a woman’s heart. So don’t wait, gift a special pearl necklace today to your wife or your girlfriend. Have You Found A Mother’s Day Gift Yet? Oysters Make Pearls. But, Exactly What Is an Oyster?